Singapore: Most expensive place in the world to install air-con..? The Government has introduced several rounds of measures to rein in the continued rise in property prices. There is some effect, yet property prices are holding their own. Recently, I visited a couple of property launches. The showflats attracted quite a crowd and the boards indicated that many units were sold - clear evidence that there was no shortage of buyers. I was told that, at the offer price of about $1,300 psf before any stamp duty, the apartments should be a worthwhile investment for my own stay or rental income. When looking at the price list, I noticed that there was a sizeable area set aside for holding the air-conditioning equipment. A unit with a total saleable area of 61 sq m had 14 sq m provided for air-con space. A quick back of the envelope calculation suggested that the buyer will be paying about $200,000 for the space to house the air-con. Considering that a multi-split air-con system costs about $3,000, I find this situation incomprehensible. 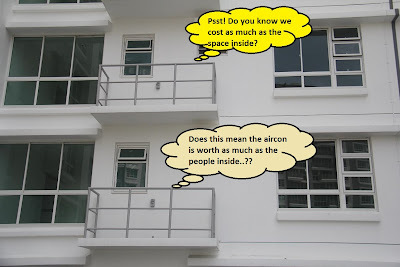 To be sure that I was not mistaken, I sought confirmation from the agent, who assured me that the 14 sq m of "air-con" area is indeed chargeable, and that the cost is to be borne by the buyer. This must make Singapore one of the most expensive places in the world to install an air-con system. To have living space costing in excess of $1,000 psf for suburban localities already makes Singapore property prices one of the highest in the world. To have air-con space costing $200,000 should be a wake-up call for Singapore to seriously re-examine its land valuation model. The wife and I are not at all surprised by the above "complaint". But we are surprised by the fact that it took so long for someone to highlight the issue in the Forum page. Those of you who have followed our new project reviews (we haven't done any in recent times, we know) would have read about our concerns with the huge air-con ledges found in most of these developments. And as long as developers continue to get such space free of charge from the Government, they will persist in building disproportionately large air-con ledges as these are literally "free money". 18 comments to ''Singapore: Most expensive place in the world to install air-con..?" It does seem to be ludicrous to pay that much for a space for the AC unit. But how about those other types of AC that doesn’t really consume that much space, like the split-type. I guess the question is, do you still have to pay for the space even if you’re not planning to install a huge AC unit? Do they have accommodations wherein they ignore the charges for the said area? The fact that planter areas, Aircon & other service ledges are included in the official strata area and therefore part of what you pay for, is well known to most buyers for many years, so it is a bit of a surprise to find this letter being published as though it is a new discovery. Manuel, you pay for everything based on the official strata area, whether you use it or not. Which seller in the world sells you property based on what areas of the property you will be using? Oh my! This is really hard to believe but oh so true. Having an air conditioning unit installed in Singapore is so expensive that I don't know if I can afford this thing If I'm in this place. Oh gosh! I just hope the government will do something about this so soon. To service and maintain your AC service regularly to avoid AC problems in the future, AC repair Davie is one of the most owned company of the Davie. Here is one of the more efficient portable air conditioner, the Newair AC-12000E. This unit has an Energy Efficiency Ratio (EER) of 14.4. Any air conditioner with above 12 EER are qualified as efficient. What's more this portable unit can be yours at $389.95 from Amazon. Contractors Today! Following are there very good reasons to contact a local company about maintaining your aircon system. If you haven't considered doing this previously, you may consider doing it today. From "Mission: Impossible" to "It's Always Sunny in Philadelphia," hvac repair somers ny systems have had celebrated supporting roles on the big and small screens. Industrial boilers, ventilation shafts, and giant furnaces are the real stars in these Hollywood stories. You got a really useful blog I have been here reading about New AC Units for about half an hour. I am a newbie and your post is valuable for me.